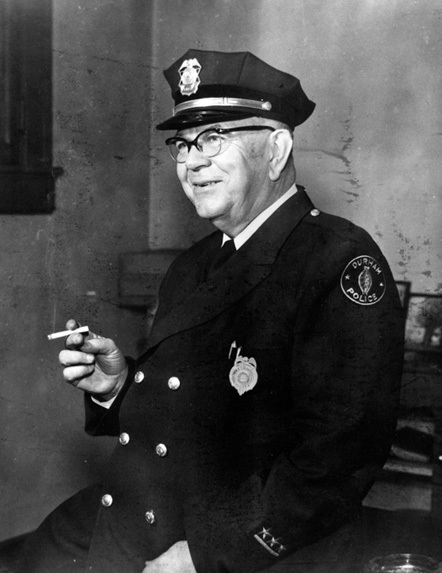 Police chief Hubert E. King (?-1956) hired James B. Samuel and Clyde Cox in 1944, the first black police officers in the Durham Police Department. Also during King’s time as chief, a black policeman was promoted to an officer’s rank and the detective bureau hired African Americans, both firsts in the state of North Carolina. Despite these moves, the police department remained highly segregated internally, as the African-American officers served only in black sections of town. King also clamped down on the prostitution that developed with the arrival of Camp Butner, a military facility north of Durham where troops trained during World War II.